This uptown penthouse in the Old Town district of Downtown Dubai is the Middle East’s answer to Manhattan. Whereas the crème de la crème of metropolitan living in the Big Apple is a view of the Hudson River with another eye on the Empire State Building, this apartment in Zanzebeel 4 offers views of Downtown Dubai, Burj Khalifa and the expanse of water that gives Business Bay its name. 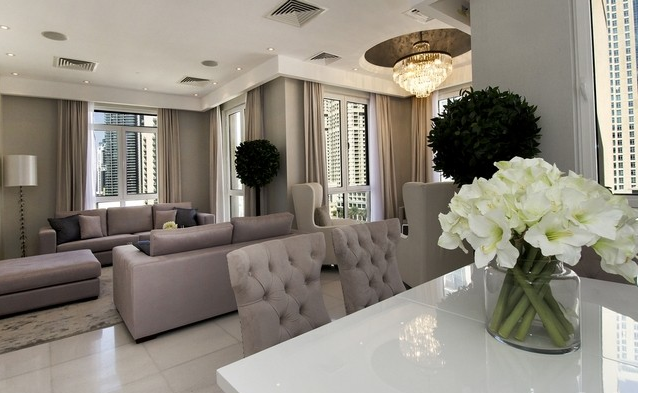 The apartment has the feel of a DIFC high flyer with enough space for guests, children and staff. It is also sold fully furnished for those who do not have the time to spend outfitting “another” residence or prefer to move into somewhere off-the-shelf with all the appropriate furniture newly acquired and installed. At 3,182 square feet, it has four double-size bedrooms, all en suite with walk-in wardrobes. There are two reception rooms, five bathrooms, a utility room, staff accommodation and a sizeable roof terrace that can hold a 12-seater table for open- air dining with views of Burj Khalifa. The building is now six years old, but the space has been entirely remodelled to a modern, European open plan style. Doorways and walls have been removed to show off the space and the price was dropped in March from Dh13 million to Dh10.5m, according to Gregory Lewis, senior negotiator at Knight Frank, the agent marketing the property. The penthouse has two parking spaces in its own garage in the building’s basement and private lift access. The building’s gym and swimming pool as well as 24-hour security are also available to the buyer. The tower itself is only eight storeys tall, giving it a community feel with The Dubai Mall and Dubai Fountains walking distance away. With Dubai Downtown now becoming the unofficial centre of the city and the area becoming an increasingly fashionable place to visit, this apartment is in the heart of the action with a sizeable discount on the original asking price. Are people still buying pro­perty in Dubai? The super-rich have not stopped buying. There is always movement at the top of the market and Dubai is no different. There has of course been a slowdown lower down the scale, where we have seen sales drop by 60 or 70 per cent, but the last month was the busiest month for the whole year with three times more inquiries and double the amount of sales than we have seen for the previous four months. Two reasons: I think those that are secure in their employment and have a three to five-year horizon see real opportunity in the market. With these sort of prices and a return on investment, it has to be better than renting, which has no ROI. Secondly, I have a list of the top 50 most expensive cities to buy on the planet and Dubai is no longer on it. The prices for real estate, considering where you are and what you get for your money, does not compare with other parts of the world. While the parallels are sometimes dissimilar, the point is made with Emirates Hills at Dh2,400 per square foot and Mayfair in London at Dh42,000 per sq ft. Also with off-plan developments, some developers on the Palm are now offering 20 per cent down payment and 80 per cent on completion – the risk has been taken out of the market. You will get what you pay for.